Identification: Upperside is brown. 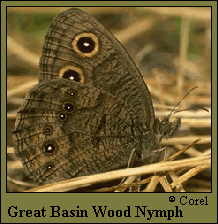 Forewing of male has 2 small eyespots, with the upper one larger; female has 2 large eyespots of about the same size. Eyespots are of equal distance from the outer edge of wing. Dark basal half of hindwing underside is separated from lighter outer half by an irregular dark line. Life history: Males patrol all day to find females, who lay eggs singly on host plants. Caterpillars hatch and go into hibernation, not feeding until the following spring. Habitat: Chaparral, oak woodland, open pine forest, juniper-pinyon woodland, sagebrush. Range: Southern British Columbia south through California to Baja California Norte; east to Wyoming, Colorado, and Arizona.